Hey friends, here is one of those get-to-know-you-better questions: what is your favorite color? Blue? Red? Teal (is that really a color)? Generally speaking, there’s no one color better than another, but the favorite color this month is: pink! 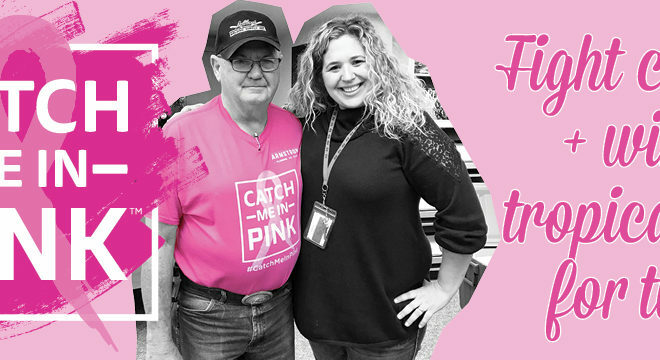 October is Breast Cancer Awareness Month, and Armstrong is kicking off the Catch Me In Pink™ campaign again this year. No Facebook? That’s OK – email the pic to info@BetterCallArmstrong.com and we’ll post it for you. For every #CatchMeInPink pic posted, Armstrong will donate $5 to the Vera Bradley Foundation for Breast Cancer. Since 1993, this incredible foundation has raised more than $30 million in contributions, targeted for assistance to those affected by this terrible disease and funding for critical advancements in breast cancer research. Each photo posted will also be automatically entered for weekly drawings for prizes such as $25 Visa® gift cards, Vera Bradley giveaways, and the grand prize: a tropical 7-day trip for two. Go to BetterCallArmstrong.com/CatchMeInPink for more information and weekly updates. So, when you need the best Lubbock plumbers or HVAC technicians, Better Call Armstrong. If you want to support a great cause and get in the running for fabulous prizes, schedule today to help paint our Facebook page pink!